What if I told you that being willing and obedient to the Lord not only releases a grace to help you accomplish the task at hand, but puts an incredible smile on God’s face. Would that change your perspective of God? Would it make you more excited about running your race knowing that God is running right alongside of you to cheer you on? 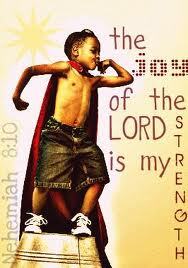 “The joy of the Lord is my strength.” What does this really mean? I’ve read commentary after commentary where the writers believe this joy is the gladness of our heart that comes from knowing God. While this sounds good, I believe it is inaccurate. I believe the joy of the Lord is a personal joy experienced by God Himself when we walk in fellowship and obedience to Him. A byproduct of His joy is a grace that is released to give us strength to continue in our walk. Please allow me to explain. In Nehemiah 8:9-10, we find Ezra standing before the recently released Israeli captives who were allowed by King Cyrus of Persia to return to their land to rebuild the temple. Opening up the Book of the Law, Ezra began reading the Word of God (the Law) to the people. For those hearing him speak, it was a bitter sweet moment. It had been many years since the people had been allowed to gather together in worship. Had Israel not moved away from God, they would not have been in this situation at all. The thought of their transgressions mixed with the Word brought the crowd to tears of sorrow. Seeing this, Ezra tells the people, “…for this day is holy to our Lord. Do not sorrow, for the joy of the Lord is your strength.” Ezra was telling the people to not be sad because God was happy; His prodigal children had come home! Now, let’s move on to the New Testament. In Matthew 25, Jesus is telling the parable of the talents. According to the parable, the lord of the house goes away for a bit of time. Before he leaves he gives talents (money) to his servants. To one he gave five, to another he gave two, and to the third he gave one talent. He gave according to their ability. After a period of time, the lord returned. Gathering the three servants, he asks them to give an account of how they had invested their talents. The one who had five talents gained another five. The one with two talents gained another two. But the one with a single talent hid his in the ground and did not have a return on the investment. To that the lord was greatly displeased. The point Jesus was making is that we are responsible to invest the gifts that God has given us in order to reach others for the Gospel. To the two who had a return He said, “Well done, good and faithful servant…enter into the JOY of the Lord. When we are walking in fellowship with the Lord, we bring Him joy which activates His empowerment grace to help in time of need. Therefore, if you are in the will of God and you need an energy boost, you can claim with utmost confidence, “The joy of the Lord IS MY STRENGTH!” Be blessed. This brings joy to my heart! Thanks!